What can Aviatrix platform do for me? How do I launch the product? What are the deployment requirements for Aviatrix product? How do I access the Controller? How do I secure the Controller access? What are the events Aviatrix Controller monitors? How do I ensure my Transit Network is secure when an Aviatrix gateway is deployed on a public subnet? Is Aviatrix Cloud Gateway a SaaS offer? What is an Aviatrix Access Account? How do I upgrade software? Is there a reference design example? What is the support model? How do I forward syslog events to my Logstash server? Can alert email be sent to a different email address? Can there be multiple admins? Is there 2FA support to log in to the console? Can there be read only account for operation team? Is Aviatrix FIPS 140-2 compliant? How to encrypt Aviatrix Controller and gateway EBS volume? Aviatrix product consists of a controller and gateways. When the product is deployed in the public cloud marketplace, what you launch is the controller instance and from controller console you launch gateways by using cloud provider APIs. When the product is deployed as a virtual appliance in a virtualized datacenter environment, the controller and gateway is bundled into one virtual image, such as OVF and VHD. The following FAQ discusses only the cloud deployment scenario. Aviatrix Cloud Gateway provides an end to end secure network solution for AWS, Azure and Google GCloud. The solution includes AWS Global Transit Network, an enterprise OpenVPN® access to VPC/VNet, encrypted routing for VPC/VNet to VPC/VNet traffic, Stateful Firewall and Egress FQDN and monitoring and logging of link status and latency. The solution enables you to build a secure private network spanning one or more public clouds where a user access any instance/VM with a private IP address directly. No more bastion stations and jump hosts, the solution gives user the seamless experience that they enjoy when using the on-prem network. For an Aviatrix overview, check out this document. In addition, the product interoperates with any third party IPSEC capable devices, including AWS VGW and Aviatrix’s own on-prem virtual appliance CloudN. Architecturally, Aviatrix solution is a centrally managed, loosely coupled and globally deployed platform built for the cloud from the ground up. The product consists of two components, the Controller and one or more gateways. The gateway is launched from the controller. The Controller provides a central console for all provisioning, monitoring and upgrades of the services. The Controller can be launched and managed by Aviatrix as a Hosted Service. The Controller is also available in AWS and Azure marketplace. It is also available as a GCloud community image. For marketplace launch, search for “Aviatrix” in marketplace. Follow Getting Started on AWS instructions to launch Controller on AWS. Follow Getting Started on Azure instructions to launch Controller on Azure. Follow Getting Started on Google instructions to launch Controller on Google. Aviatrix Controller and gateways are deployed on public subnets with public IP addresses for Internet access, as shown below. If your Controller is launched as AMI from marketplace, you access the Controller instance via a web browser. Login with username “admin”. The first time password is the private IP address of the controller instance. You are required to change the password at your first login. If you are using Aviatrix Hosted Service (AHS), following the instructions sent to you to access. There are several ways to secure your Controller access, as discussed below. Only TCP port 443 needs to be opened for inbound traffic to the controller. If you wish to reduce the scope of source addresses by specifying custom IP address, you must include all gateway public IP addresses, in addition to your own public IP address. This is because gateways launched from the controller use its public IP address to communicate back to controller. You can use the Controller Security Management feature to automatically manage the Controller instance’s inbound rules from gateways. Go to Settings -> Controller -> Security Group Management, select the primary account, click Enable. When this feature is enabled, the Controller will immediately create 4 security groups. Since each security group can support 50 security rules, the Controller can support up to 200 gateways. After this feature is enabled, you can now edit the security rules that are outside gateways public IP addresses to limit the source address range. Avitrix Controller is shipped with a self-signed certificate, therefore there is a “Note Secure” warning sign shown on your browser console. You can change that by importing your own signed certificate. To do so, go to Settings ->Advanced -> Security. At the panel “CERTIFICATE REQUEST - SEND TO CERTIFICATE AUTHORITY”, send a CSR (certificate sign request), then follow the instruction to import CA and signed Controller certificate. You can also use an ALB in front of the Controller. You can disable access from browser that runs TLSv1 and TLSv1.1 and only support TLSv1.2. To do so, go to Settings -> Advanced -> Security -> TLS VERSIONS SUPPORT. Uncheck TLSv1 and TLSv1.1. In addition to username and password login credentials to the Controller, you can also enable LDAP or DUO authentication. To enable LDAP authentication, go to Settings -> Controller -> LDAP Login and fill the form. To enable DUO authentication, go to Settings -> Controller -> 2FA Login and follow the instructions to setup DUO. You can create read_only accounts for your operations team. They can view and list pages but not making changes. Follow the answer to have it setup. “admin” account login can be disabled and instead use account user. To disable admin login to the Controller, go to Settings -> Controller -> Login Customizatioin. Click Disable. Follow the instructions here to encrypt the Controller EBS Volume after the Controller is launched. Aviatrix Gateway EBS volume can be encrypted after it is launched following the same instructions. In addition, we provide an open source script to automate the process. You can enable SAML authentication for Controller login. VPN tunnel status. Alert when it goes down and alert when it comes back up. Gateway health status. Alert when gateway goes to down state. Alert when it comes back up. Overlap network CIDR range. Alert when BGP routes overlap. Route limit. Alert when BGP route limits reach a threshold. TGW Auditor. Monitors the configuration changes, alert when there is inconsistency between AWS console and Aviatrix Controller for resources related to TGW operation. IAM policy. Alert when account IAM policy is not up to date. Guard Duty integration. Alert and block malicious IP addresses. Blackhole route. Alert when VPC route table has in active routes. Public subnet. Alert when there are unwanted instances launched on specific public subnets. Some organizations have concerns about having public subnets in a VPC. The concern is that if there were a public subnet in a VPC, users may find ways to launch an instance on the public subnet and associate the instance with a public IP address, thus enabling the instance to access Internet without going through a proper egress firewall (in the cloud or on-prem). However when deploying a AWS Global Transit Network solution, a vendor gateway must be deployed on a public subnet in the Transit VPC. This is true for all vendor appliances on the AWS marketplace. 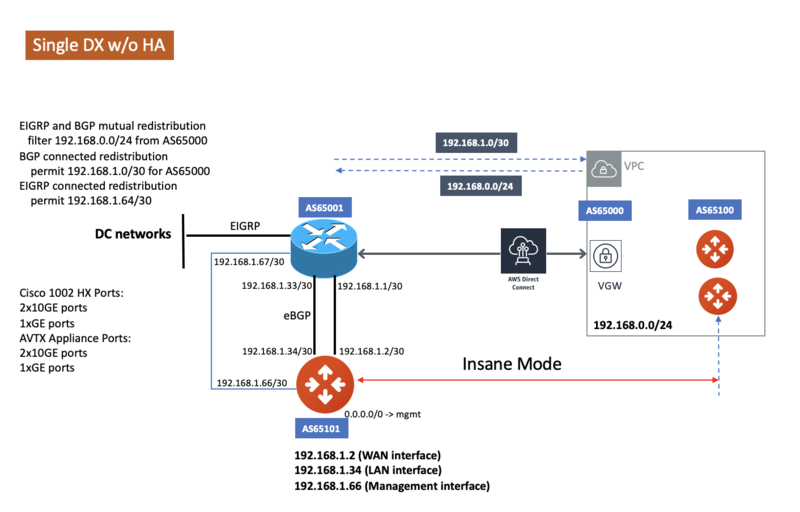 This is because the vendor gateway in the Transit VPC establishes IPSEC tunnels with Spoke VPC over public IP address, whether or not the Spoke VPC deploys a vendor gateway or VGW. Another reason is the vendor gateway requires SSH access to configure its VPN tunnels. Note that this connectivity between Transit VPC and Spoke VPC, although using public IP addresses as IPSEC tunnel end points, does not imply that traffic between Transit VPC and Spoke VPC go through the Internet. AWS recognizes that it owns these public IP addresses therefore always try to route the traffic through its own backbone network without ever going out to Internet. In addition, Aviatrix provides multiple features to ensure your Transit Network is secure, as described below. If you use AWS Transit Gateway (TGW) to build a transit network, the Aviatrix gateway is only launched in the transit VPC, all spoke VPCs have no Aviatrix gateway. Enable Gateway Subnet Monitoring. When this feature is enabled, the Controller will monitor the selected public subnets periodically. When it detects any instances being launched on these subnets, the Controller will alert the admin and stop the instances. Enable VPC Egress Firewall . If you need to optimize application performance, you should consider allowing instances to access Internet directly, rather than backhauling to on-prem. When this feature is enabled, any traffic initiated from instances on the private subnet must go through the inline and in VPC egress whitelists before going out to Internet. Enable Remote User VPN . If you need to optimize developer experience (less latency, higher bandwidth), you should consider allowing users to access instances in VPC directly with SSL VPN. When this feature is enabled, all user traffic is tracked and logged for audit and tracking purpose. Secure the Controller. Follow the guidelines here to secure the Controller access. Log Everything. Enable Logging to send all events from gateways, Controllers and user activities to your favorite log service platform for audit and compliance. No. The Aviatrix Controller and gateways are software product that is deployed in your own network perimeter. The first time when you login, complete Onboarding process. It takes a few steps. If you have a BYOL license or use a community image, you need to have a customer ID provided by Aviatrix to be able to use the product. Contact support@aviatrix.com if you do not have a customer ID. An Aviatrix Access Account is specific and unique on the controller. It contains cloud credentials, for example, your AWS IAM Access Key ID and Secret Key. The controller uses these credential to launch Aviatrix gateways by using cloud APIs. An Aviatrix Cloud Account can correspond to multiple cloud account. For example, it can contain credentials for an AWS IAM account, Azure account and GCloud account. Click Settings -> Upgrade. This upgrades to the latest release of the controller software. When a new release becomes available, an alert message appears on Dashboard. An email will also be sent to the admin of the controller. For support, send email to support@aviatrix.com. We also offer premium customers with 24x7 support. To request a feature, click Make a wish button at the bottom of each page. Click on Settings-> Logging ->LogStash logging and input the required parameters to enable forwarding of controller syslog events and all gateways syslog and auth log to a Logstash server. SUMO Logic, Splunk, DataDog and rSyslog are also supported. Encrypted tunnel (peering and site2cloud) status is monitored. When a tunnel status changes, an alert email is sent to the controller admin. Yes, you can choose an alternative email address to send alert messages. This is useful if the controller admin is different from the operation team. Yes. Username “admin” is the default admin user. But you can create multiple users with admin privilege. Follow the instructions to learn more about setting up multiple admin users. Yes. In addition to password login, DUO authentication and LDAP are supported. Starting from Release 4.2, SAML authentication is supported to login to the Controller console. Yes. Accounts -> Account Users -> Add A NEW USER, at Account Name field, select “read_only” from the drop down menu. This user account will have views to all pages but cannot make changes to any configurations. FIPS 140-2 approved crypto functions can be found in this link.. According to this document, the following algorithms that are supported on Aviatrix are FIPS 140-2 compliant. SSL VPN encryption algorithm is AES-256-CBC. SSL VPN authentication algorithm is SHA512. Internet Key Exchange (IKE) protocol is the control plane to IPSEC data encryption. Its responsibility is in setting up security association that allow two parties to send data securely. There is no difference in data encryption algorithm and data encryption strength itself between IKEv1 and IKEv2. The primary difference between IKEv1 and IKEv2 is it takes fewer messages to establish the security association in IKEv2. There are a couple of other differences regarding IKEv2 has a better support for mobile devices which does not apply to site to site and site to cloud VPN where Aviatrix is being used. You can follow the instructions here to encrypt the Controller. For automation, you can reference our python script on github repository. Starting Release 4.2, Aviatrix gateway EBS volume can be encrypted from the Controller console.